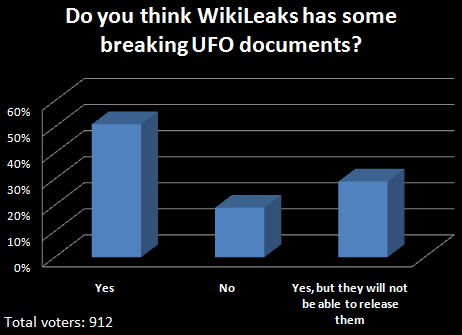 Poll #18: Do you think WikiLeaks has some breaking UFO documents? what causes ufo report is the title of this section: ok, for example you are driving by a lonely route and at once you see something that tremble at you because of a spacecraft from other world is landing (remember The Invaders with David Vincent). Well, the only you want to do at that moment is run away as soon as possible to find people, policemen,etc to tell them the experience you have had. I also like the idea of some being space based life forms, like &quot;Tin-man&quot; from Star Trek TNG or the ship from Farscape. Even some of the small lights seem to behave like animals of some sort investigating things on Earth.